Rainout occurs when the warm air leaving the PAP machine’s humidifier is cooled, as it advances through the tubing to the attached mask. This condensation can accumulate over time creating a gurgling noise in the tubing and a spilling over of the water onto the face. Needless to say this is an uncomfortable situation, and usually wakes the user, preventing a quality night’s sleep. Rainout usually occurs to a greater degree during the cooler months of the year, when room temperatures decrease. Although rainout can be a real nuisance, humidification is a very beneficial aspect of your overall PAP therapy. There are a couple things you can do to minimize rainout or eliminate it altogether. Using a heated tube with the humidifier maintains a constant air temperature throughout the tube until the air reaches the mask. A heated tube can be added to most PAP models. Latest model PAP devices offer the heated tube feature. If you do not have a heated tube, or don’t want to add one, you can use a tubing wrap. 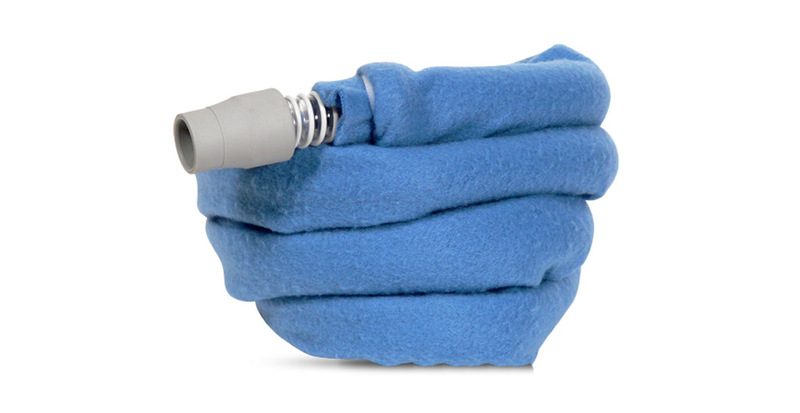 The wrap helps to keep the air in the tubing warm, and is effective in reducing condensation and resulting rainout. Contact us today for more information about a solution to your “rainout” problem. Send us an email at cs@m4cpap.com , or give us a call at (800) 696-2968.